The country's premier Apple partner is set to open its biggest branch at the Expansion Wing of Festival Supermall in Alabang on December 15, 2017 at 11AM. This is your perfect excuse to go gadget shopping as Power Mac Center is giving special treats on the opening day especially for loyal Apple fans. Great discounts awaits every one. Special treats include MacBook Air, iPhone 8, iPhone 8 Plus, iPad (5th gen), urBeats, and many, many more at 20% off which is valid from 11:00am to 11:20am only and subject to stock availability. 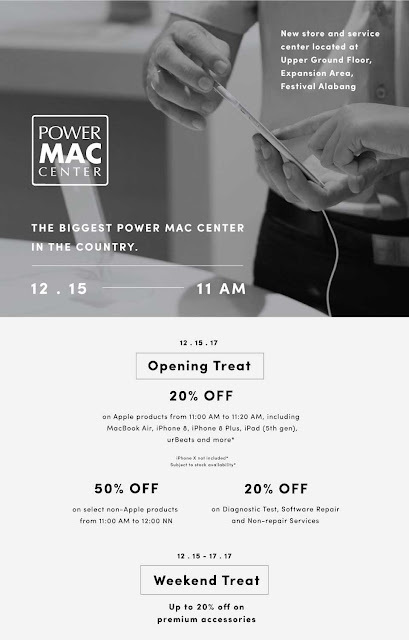 Of course, non-Apple products get a special treat of 50% off from 11:00am to 12noon on selected items. Good news also if your gadget needs Diagnostic Test, Software Repair, and Non-repair Services because you'll be given 20% off the whole day. This is valid for cash, debit and straight card payments only though. But there's more good news especially if you can't make it on the opening day. Premium accessories are at 20% off from December 15-17. This is your chance to snag that new iPhone 8 or MacBook Air or even a new case for your iPad, or as a gift. "The new store and service center in Festival Supermall- our biggest one yet- is a testament to the growing patronage of Filipinos to the brand. We are pleased to be able to serve them by being readily available to support all their Apple needs," said Power Mac Center Marketing Director Joey Alvarez.